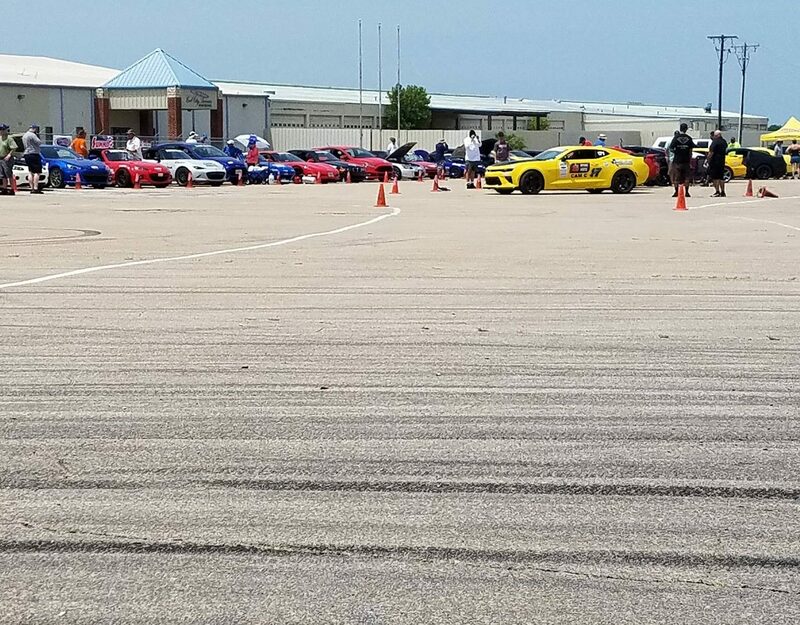 This weekend in Mineral Wells, the heat from the sun almost matched the heat of mega-powered American V8s at the second stop of the 2017 SCCA CAM Challenge. 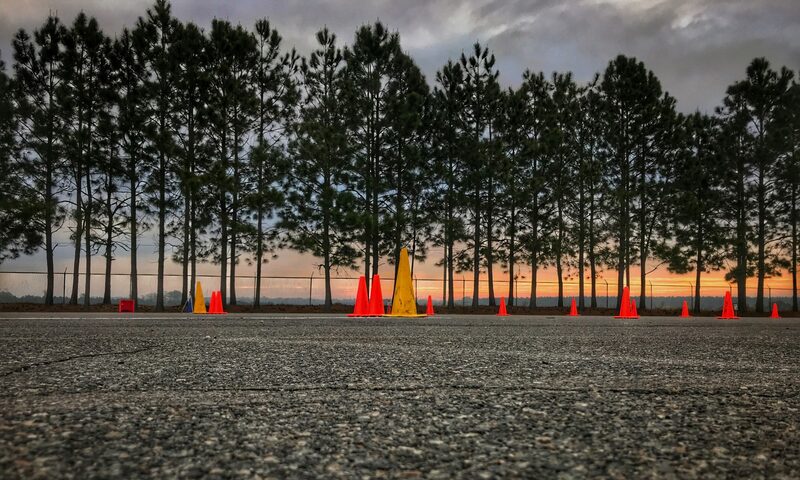 Blistering temperatures couldn’t keep the drivers away, as 74 hardy souls took to the course for two days of competition. The event was scheduled for three days, with the first day, Friday, allotted for practice. Unfortunately, especially for those of us driving cars we weren’t familiar with, practice never happened, and I got the impression it was because of a miscommunication between the host region and the national office. Many drivers showed up early on Friday to try to get in some extra runs, and we were left twiddling our thumbs. Texas Region did a great job with the event, and my hat’s off to everyone who helped set it up, but hopefully next time they’ll be able to do so without omitting anything. For those who aren’t aware, the CAM Challenge is made up of two different events, with a six-run “Tour in a Day” on Saturday, followed by three runs of qualifying before a single run, single elimination Challenge style bracket on Sunday. Trophies are awarded to the top five in each class for the Tour portion, and the first class to finish were the two-seaters of CAM-Sport. With a very open rules format, a wide variety of cars were at the top of the order, and finishing first was David Lousteau in a monstrous 1965 Shelby Cobra. His lead after the morning session was .9 seconds over David Whitener driving the radical Dusold Designs Camaro, and he added another .8 seconds to his lead in the afternoon. Camaro owner Mike Dusold finished third, three tenths behind Whitener. Brian Matteucci and his C5 Z06, in fourth, was the fastest modern CAM-S car, while Lousteau’s co-driver Eric Davis rounded out the trophies. In CAM-Traditional, for vintage musclecars, multi-time national champion Mark Madarash put on a clinic with his 1988 Firebird, gapping his closest rival, Mark Tucker in a gorgeous blue 1970 Camaro, by more than three seconds. The rest of the trophies were a lot closer, with Derrick Torres, Wayne Atkins and Mike McShane, all driving Camaros, finishing within a second of Tucker. By far the closest battle was between the modern ponycars of CAM-Contemporary. Scott Steider in his 2017 Mustang took the morning session by less than .3 seconds over Keith Lamming’s 2011 Camaro, but Lamming was fastest in the afternoon by a little over three tenths, putting him in first by .056. Rusty Henderson, Lamming’s co-driver, was third, while Corey Pettett and WB Sephus, both in Mustangs, rounded out the trophy positions. All of those results are thrown out for Sunday’s Challenge, which gives competitors a fresh start, enabling them to overcome any difficulties they may have had the previous day. In an effort to reduce worker fatigue in the blistering conditions, as well as reduce the overall number of workers required to maintain the course, a new idea was tested. Cone shaggers would ride in a chase car behind the competing cars and pick up anything moved or knocked over. With the exception of a delay due to massive cone carnage caused by a certain C6 Z06 driver, possibly my car owner though reports are vague, the system worked very well, and I could see it instituted in the future. To no one’s surprise, Mark Madarash qualified first in CAM-T and cruised through to a final round showdown against second qualifier Kyle Tucker, despite a failed starter that meant the Firebird had to be push-started before each run. Tucker’s road was a lot rockier, as he survived the semi-finals against Derrick Torres’s 1968 Camaro by less than a tenth of a second. With temperatures rising and the course seemingly slower, Madarash didn’t quite put on the dominating performance he did the previous day, but .8 seconds was still a convincing margin of victory. In CAM-C, Scott Steider elected not to run the Challenge, leaving Keith Lamming and Rusty Henderson, Lamming’s codriver, as the top two qualifiers. However, Chad Langley, driving a sparkling new 2017 Camaro 1LE, defeated Henderson in the semi-final round by .6, leading to a fifth vs. sixth generation Camaro showdown in the finals. In the end, Langley prevailed as Lamming coned away a faster raw time. CAM-S was the final Challenge bracket to run, and in the final round, it was David Lousteau’s monster over Brian Matteucci’s C5 Z06 by a half second. Considering Matteucci’s Corvette has mostly bolt-on modifications with a lot of factory pieces still in place, it acquitted itself quite well against the killer Cobra. 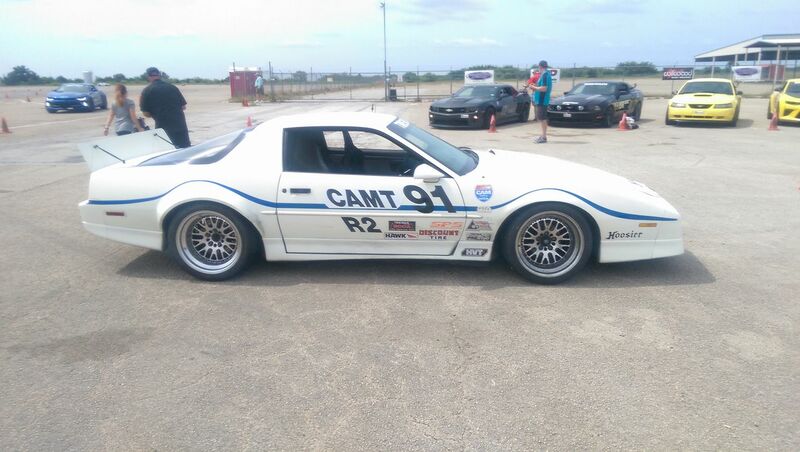 Of note was Chris Ramey, who made it all the way to the semi-finals with his 1984 Corvette. It was great to see the older C4 platform still competitive against the other cars in CAM-S (although the LS7 under the hood may have helped), and I hope to see more of it in the future. To determine an overall victor, all three Challenge winners were pitted against each other in a PAX handicap shootout. Each would have two runs, giving everyone an equal opportunity to warm their tires, with their best counting towards the results. Madarash and Lousteau both had strong first runs, with the former’s 68.476 giving him the lead on index by about three tenths over the Cobra’s 67.110. Langley spun his first run, and though he’d clean it up with a 69.830, he’d finish third. Madarash’s second run was only slightly faster at 68.450, but Lousteau was last, and all eyes were on him as he flew through the course. And fly he did, tripping the lights with a 66.694, enough for the win by just .034 seconds. Despite the extreme heat, with temperatures pushing triple digits, it’s safe to say that the competition was the hottest part of the weekend. CAM is always a great time, and for sure it’s one of the best sounding autocross events, with a cacophony of thumping V8s resonating through the site. The next SCCA CAM Challenge will be August 11-13 in Peru, IN, and I’d suggest checking it out if you can. 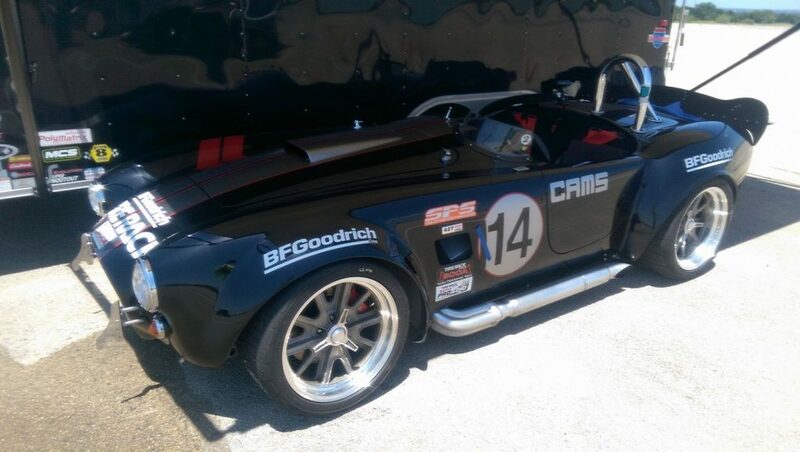 Drivers of American sports and muscle cars will be headed to Mineral Wells, TX, next week for the second stop of the 2017 SCCA Classic American Muscle Challenge. 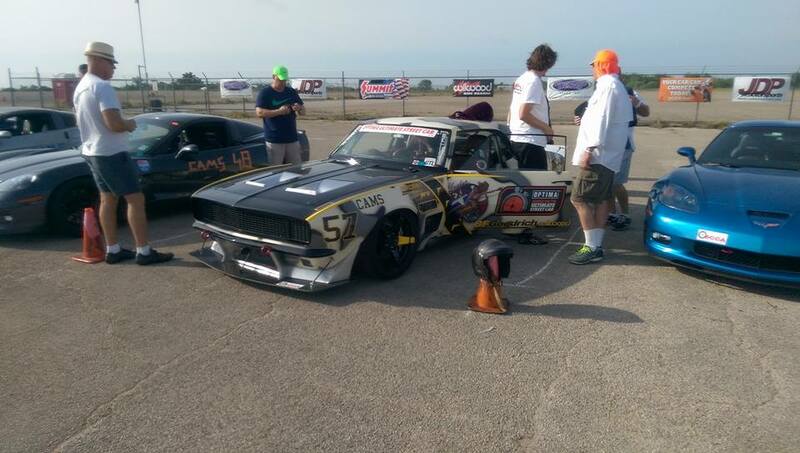 CAM was conceived in 2014 as a place where owners of highly modified, V8 powered, American cars on 200 treadwear street tires could compete against each other without having to conform to a “regular” SCCA class. With a very open rule set and only three classes, it’s very much a “run whatcha brung” type of deal that brings out some of the wildest machinery to ever carve up the cones. There may only be 61 entries as of this writing, but there’s no shortage of talent in the field. 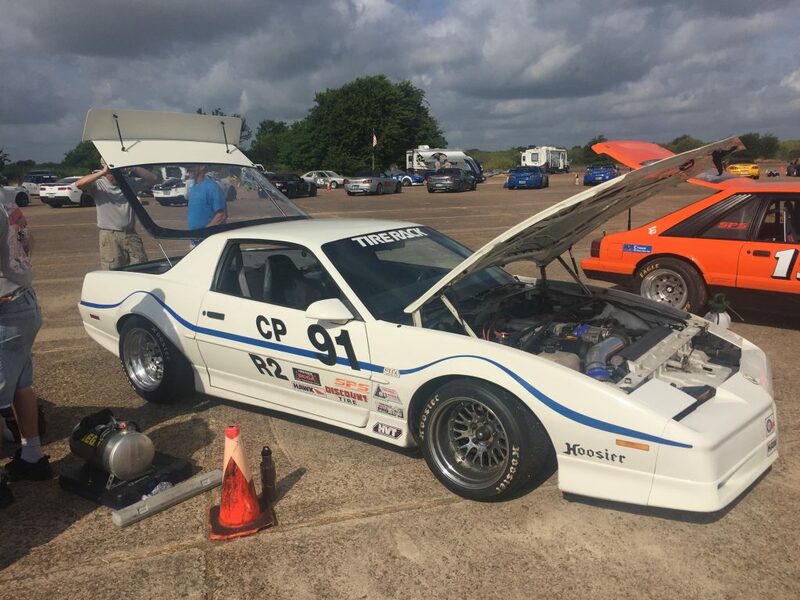 Leading the charge in CAM Traditional, with Traditional signifying cars designed before 1990, will be multi-time national champion Mark Madarash in his ubiquitous 1988 Firebird. Daniel McCelvey, Lane Borg, and Brian Matteucci will be wheeling various Corvettes in the CAM Sport two-seater class, while Scott Steider’s Mustang will be one of many modern pony cars competing in CAM Contemporary. All will be chasing Mike Dusold, whose incredible first-generation Camaro cleaned up at last year’s Challenge with an overall win. Be sure to check back here on NAXN to see how it all pans out.